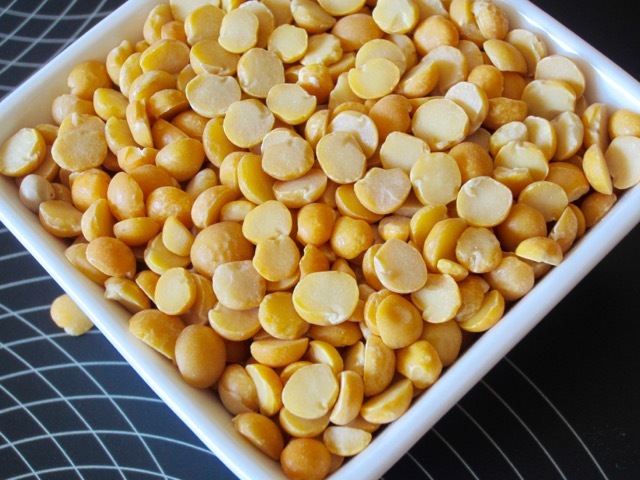 What is yellow split pea? 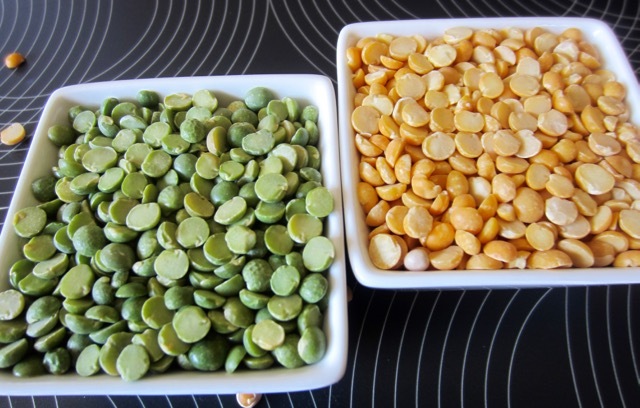 Below is a photo of whole yellow peas and Split yellow Peas with the testa (seed coat) removed. 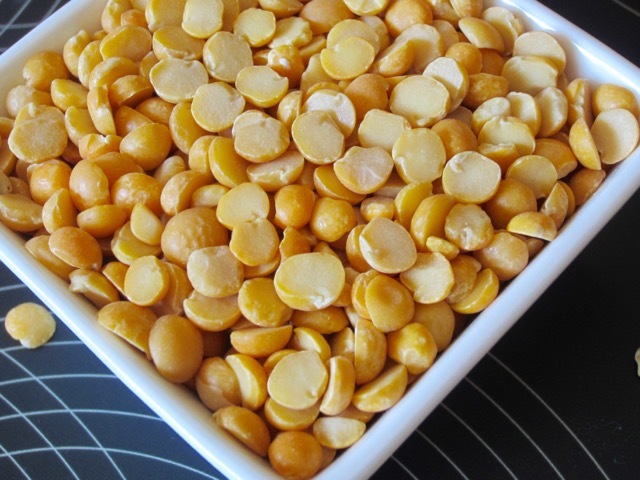 Yellow Split pea, also known as the Field Pea, Soup Pea, dry pea or Matar Dal, belongs to the species Pisum sativum, together with the fresh garden peas, Sno-Pea and Sugar Snap Pea. It’s a cool-season crop grown for its mature dried edible seeds, which can be marketed whole, split or ground into flour. The dried seeds are enclosed in a pod, 1 to 4 inches (2.5-10cm) long that often has a rough inner membrane and 4-9 seeds. The mature seeds are round, smooth or wrinkled, and with a green, yellow, beige, brown, red-orange, blue-red, dark violet to almost black, or spotted, seed coat (testa) depending on the variety. 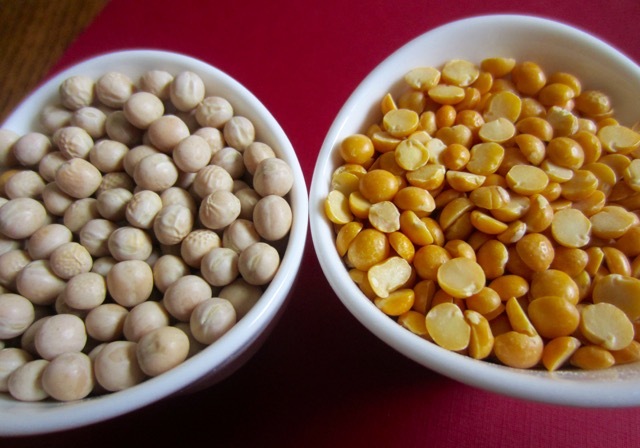 Only selected varieties of the green and yellow peas are sold for human consumption in whole or split form or ground into flour. Other varieties are produced for animal feed, and for seed. The mature yellow peas are dried and husked (or dehulled) and split in half. 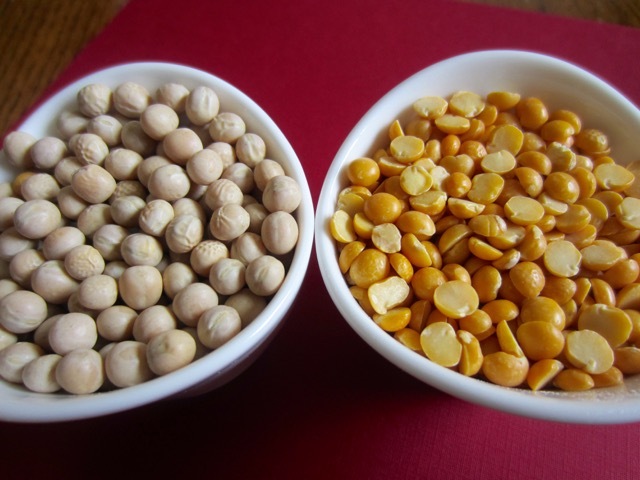 The yellow split peas are about 1/4 of an inch wide and yellow in colour. 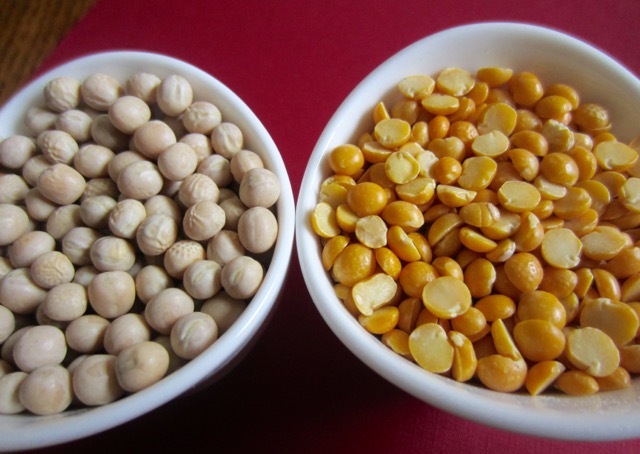 Split yellow peas are high in protein and low in fat. They contain the highest amount of dietary fibre, with 27 grams fibre per 100 gram portion. 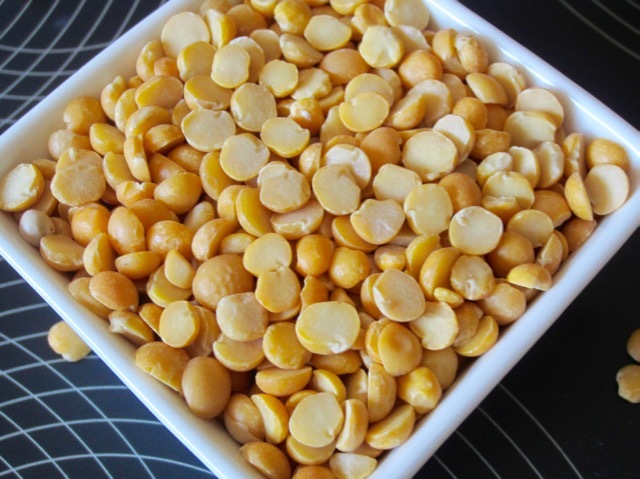 In the UK, dried yellow split peas are used to make pease pudding (pease porridge). Yellow split pea is used as an ingredient in “Khoresh Gheymeh”, a traditional Iranian dish with meat and yellow split peas. Also used as an ingredient in Tabriz köftesii (kofta specialty) . The split or whole peas can also roasted and salted, and eaten as a snack. Pea soup is eaten in many parts of the world, including northern Europe, parts of middle Europe, Russia, Iran, Iraq, India, Guyana, Suriname, Trinidad and the Fiji Islands. Peas soup can be cooked with with smoked ham, pork belly or thick cut bacon, pork chops, smoked sausage or ham hocks; with vegetables like carrot, potato, celery, leek, onion and celeriac and herbs like bay leaf, thyme, parsley or oregano. It’s a matter of preference. The processing of pea soup is an important industry in Canada. 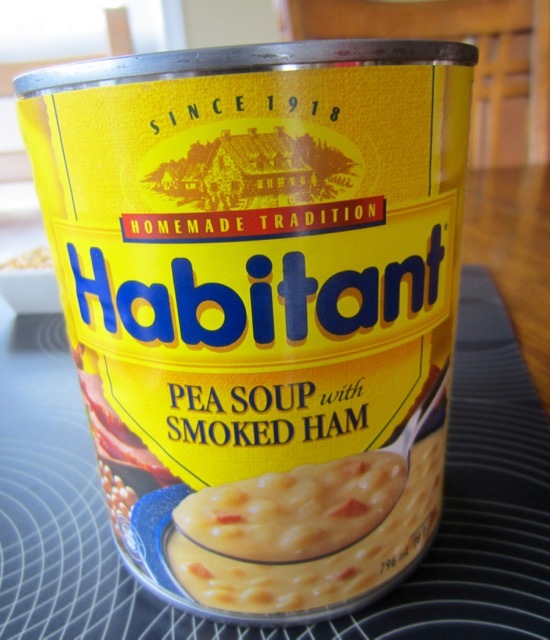 Habitant® soups have been prepared since 1918 using traditional recipes. They use split yellow peas. Yellow or split pea soup I could live on! I always cook a bone in ham on New Years and do it intentionally so I can make the soup! I’m salivating just thinking about it! I know what you mean. It tastes really good. Sorry I’ve been so lazy of late. Not posting much but am now trying to get back to routine. Have a brilliant day!